Alaska (/əˈlæskə/ ( listen)) is a state in the United States. It is in the Northwest corner of the continent of North America. Alaska does not touch any other US state. It has borders with Canada, the Arctic Ocean, the Pacific Ocean, and the Bering Strait. Alaska is the biggest state in the United States. It is the 4th least populated state. It has the lowest population density of all the states. About half of the population of Alaska lives in the Anchorage metropolitan area. 722,718 people live in Alaska. 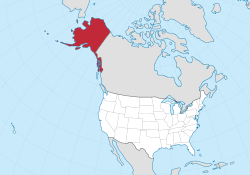 The United States bought Alaska from Russia on March 30, 1867. This was called the Alaska Purchase. It cost $7.2 million. Today, that would be $120 million. The price was about $0.02 per acre ($4.74/km2). 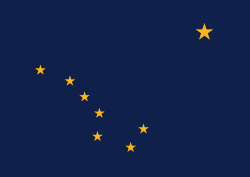 Alaska became an organized (or incorporated) territory on May 11, 1912. It became the 49th state on January 3, 1959. The name Alaska comes from the Aleut word alaxsaq. This means "the mainland" or "the object towards which the action of the sea is directed." The land is also called Alyeska, which is another Aleut word that means "the great land." The Russian name was Аляска. The capital city is Juneau, but the biggest city is Anchorage. Alaska is the biggest state in the United States, but it almost has the least people. Alaska has almost 20% of all the land in the U.S., but only about 0.2% of the people. It is not connected to any other states by American land, but it is connected to Canada. State bird: Willow Ptarmigan, decided by the Territorial Legislature in 1955. It is a small (15–17 inches) Arctic grouse that lives among willows and on open tundra and muskeg. Feathers are brown in summer, changing to white in winter. The Willow Ptarmigan is common in much of Alaska. State dog: Alaskan Malamute, since 2010. State fish: King Salmon, since 1962. State flower: wild/native Forget-me-not, decided by the Territorial Legislature in 1917. It is a perennial that is found throughout Alaska, from Hyder to the Arctic Coast, and west to the Aleutians. State fossil: Woolly mammoth, since 1986. State gem: Jade, since 1968. State insect: Four-spot skimmer dragonfly, since 1995. State land mammal: Moose, since 1998. State marine mammal: Bowhead Whale, since 1983. State mineral: Gold, since 1968. State sport: Dog Mushing, since 1972. State tree: Sitka Spruce, since 1962. ↑ "Alaska: Population estimates". U.S. Census Bureau. July 1, 2017. Retrieved May 6, 2017. ↑ "Median Annual Household Income". The Henry J. Kaiser Family Foundation. Retrieved January 27, 2018. ↑ "Annual Estimates of the Resident Population for the United States, Regions, States, and Puerto Rico: April 1, 2010 to July 1, 2011" (CSV). 2011 Population Estimates. United States Census Bureau, Population Division. December 2011. Retrieved 2011-12-21. ↑ Video: 49th Star. Alaska Statehood, New Flag, Official, 1959/01/05 (1959). Universal Newsreel. 1959. Retrieved 2012-02-20. ↑ "Alaska Conservation Foundation – State Symbols". Archived from the original on 2009-02-25. This page was last changed on 25 January 2019, at 22:51.